Today's Image of Mars shows a perspective view of western Acidalia Planitia, a large basin in the northern lowlands. 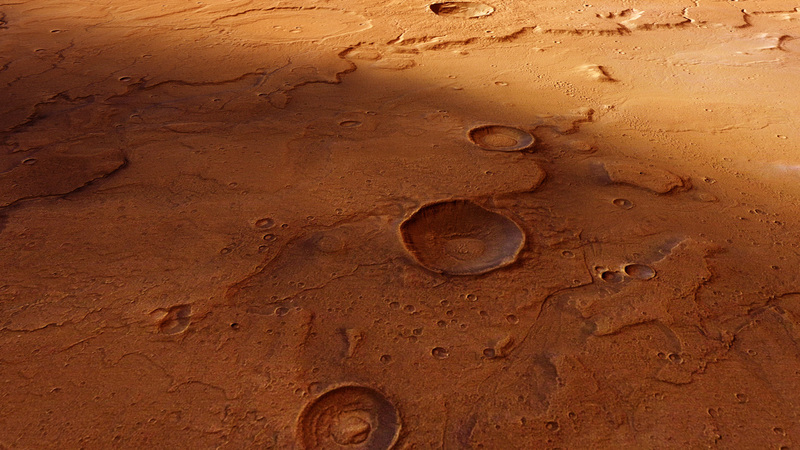 Acidalia Planitia is further evidence that Mars once contained vast quantities of water, which shaped the surface. You'll notice that most of this image appears to be in shadow, but that is not the case. The contrast is actually a variation in material. The darker sand is likely volcanic in origin, but the brighter material is actually bright dust that has overlain the darker material. We cannot be sure why only some of the area is covered by bright dust, but further analysis of the issue could help us to determine how quickly different features on Mars are overlain with new deposits. Understanding this will let us get a better idea of what lies just under a small layer of dust. If we reveal this, missions could be sent with the sole purpose of uplifting dust to see what lies beneath.